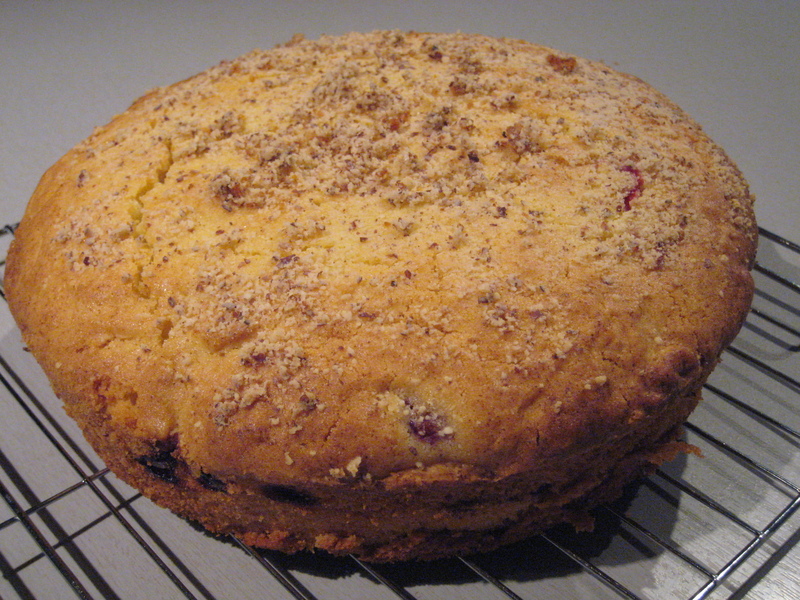 After browsing the recipes on Lottie and Doof I chose to make this recipe for an afternoon tea cake. 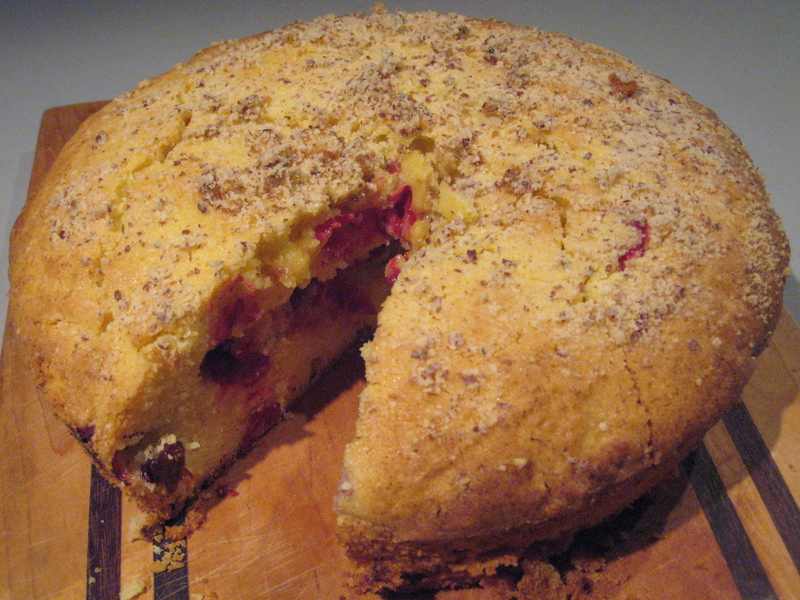 I added a sprinkling of ground almonds on top, and used frozen cranberries and a few raspberries instead of the fresh fruit mentioned in the original recipe. Love this cake, even after a bit of a mistake on my part – I baked it in an 8-inch pan rather than the 9-inch pan that the recipe called for. I had to leave it in the oven a lot longer than the recipe called for, and even then it was a little soft in the middle – but still so good! The outside was a little crispy, which I actually liked – some mistakes are worth making! 1. Line the bottom of a 9-inch round cake pan with parchment paper and preheat the oven to 350F. Melt the butter and allow to cool a little. 2. 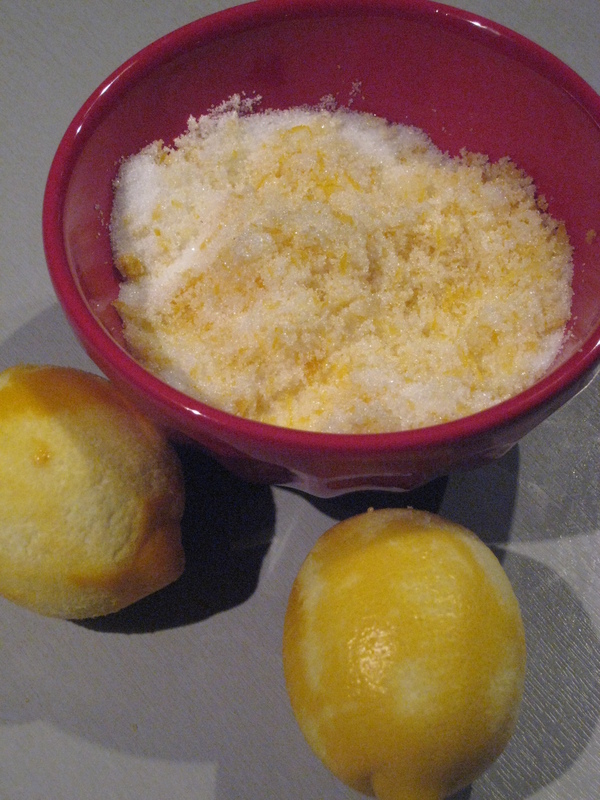 Mix the lemon zest into the sugar with your fingertips to release the oils. 3. Crack the eggs into a large bowl and mix them with the sugar and salt. Beat with an electric mixer for quite a while, until it has about doubled in volume. 4. Very gradually beat in the olive oil, butter and lemon juice. 5. Fold in the flour and baking powder, being careful not to mix too much. 6. Pour half the batter into the pan, put a layer of fruit down, then add the rest of the batter on top of the fruit. 7. Bake for 35-40 minutes. You can check it by inserting a toothpick and seeing if it comes out clean. After cooling a bit you can remove it from the pan by running a knife around the edge and inverting onto a wire rack.